The Genius Steam mop from Shark clearly differentiates itself from the competition thanks to some awesome features. 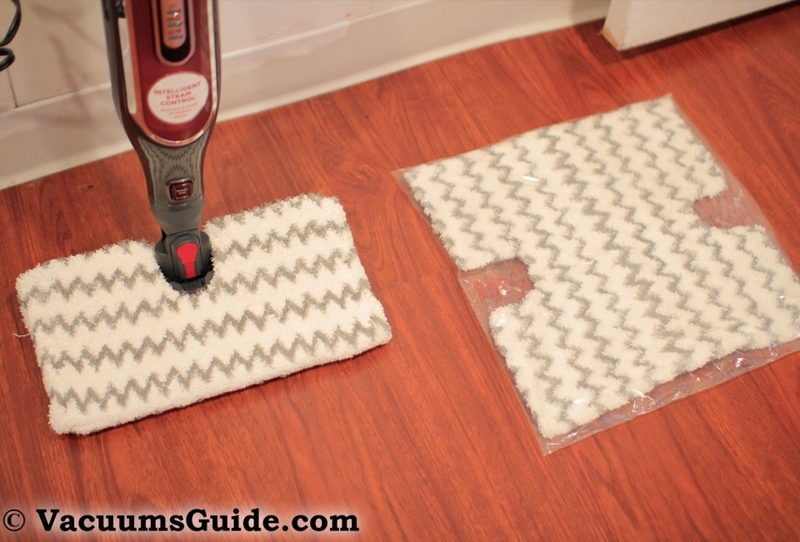 It has a double sided nozzle, meaning that you can flip it at any time and continue mopping. This system practically doubles the cleaning surface. Then there is the blast feature. Steam is released with power through a cavity located at the end of the stick. Once you're done steaming, you don't really need to get your hands dirty, thanks to a new technology called Touch-Free. The cloth pad can be dumped directly into the washing machine. The rest of the specs are borrowed from its older brothers. Mopping is a common cleaning activity, especially with the upcoming Easter holidays. Everybody can do it, it’s not rocket science. Floor mops were at the beginning dependent on a bucket of water. Time changed this, with the introduction of the steam cleaning technique. Shark has a long history of building steam mops. Every once in a while, they renew their line of models with a new unit, which steams and mops better than the others. That time has come now, as I will be presenting today the latest Shark product in this field, the Shark Genius Steam Pocket Mop. But first, a little bit of history: a couple of years ago, I was talking about one of their first models, the Steam Pocket mop. A few months later, I received from SharkClean the Steam & Spray Pro mop. The last steam mop I reviewed from this company was the Shark Blast & Scrub. The rapid evolution of these models shows that Shark is gradually improving their technology. The Genius mop is at the moment one of the most advanced yet simple to use steam mops on the market. Starting with the Touch-free technology and ending with the electronic steam control, this steam mop has a lot to offer. It cleans and sanitizes all types of sealed hard floors with the help of a steam blaster system and a new type of dirt grip pad, measuring 13″ x 7″. This is designed to hold and lock dirt in its fibers, and thus the exterior surface can trap, pull and lift more dirt than before. The washable nature of the pad cloths enhances cleaning and maintenance. The pads should be washed and dried after every use (don’t use bleach or fabric softener). Another point to be discussed here: you don’t need to touch them when you’re done: the touch-free technology keeps the tough and greasy dirt on the pads; not on your hands. An adequate amount of steam can be set up using the three-setting steam control, which is just perfect for every cleaning work. For tough messes, you can use the “Hi” option, while for moderate cleaning you can use options “Med” or “Low”. At the end of the stick, near the nozzle assembly, the Steam Blaster can deliver powerful steam bursts, for quick and easy clean-ups. The electronic steam system runs on a fairly decent power: 1200 watts (8.75A at 120V). The sturdy and durable construction supports a cord length of 22 ft. The plastic clips on its back help you to properly store the cable. The tank holds up to 350ml, which is an equivalent of 11.8 fl oz of water. This is just the perfect capacity that can be accommodated by any functional steam mop in the market. This will easily cover around 1000 sq ft. Water is cheap, effective and healthy, as opposed to most expensive chemicals out there. A hard water filter is more that necessary to avoid or at least reduce the intensity of surface scaling. Shark Genius has a sophisticated filtering system, yet I recommend you to use distilled water, in order to increase the life of this mop. In its complete package, Shark Genius weighs almost 6 lbs. This is fairly lightweight considering its widely used types of material: metal, plastic, and rubber. The overall dimensions are 47.1 x 11.8 x 11.8 inches. A 2-year/5-year VIP warranty protects your purchase (depending from where you’re buying). It’s wise to make your purchase from authorized retailers (such as Amazon) or directly from Shark’s website, to avoid running the risk of fake warranty claims. If you buy from Amazon, you will enjoy a 5 year warranty, a better price, and will receive in the package the Genius mop, another stick bar called Spray Pocket, the Genius nozzle, 2 Dirt Grip pads and a filling flask. If you buy directly from Shark, you’ll pay around $20 extra, have a 2-year warranty, but you will additionally get a triangle mop head w/ a triangle Dirt Grip pad and a spray bottle with a cleaning solution and a clip which allows you to store it directly on-board the product. The triangular scrubber pad and the triangular scrubber head are among the very essentials. The good news is that you can purchase them separately for approximately $10 or so. No other additional accessories included but for floor mopping, I believe you’re set to go with these. The steam is heated at 212 F, while the water heat up-time is around 30 seconds. The dual-sided design of the dirt grip pads is a great idea. So is the simple Spray pocket mop – its lightweight and flexible. The touch-free technology is without a doubt a small plus. The user manual will get you started right from the installation process (which lasts under 1 minute) to using the device. The instructions are straight forward and one can handle this product in the least time possible. It’s a bit more expensive than its contenders, at around $100 (depending on the extras). Cleaning width 13" 11.5" 11.5"
Cleaning width 13" 12.5" 11"
Shark Genius steam mop compliments any contemporary home setting with its sleek and flexible design. This product guarantees a high level of performance and sanitation without using chemicals that can be harmful to the health. It’s one of the environmental-friendly devices we need to keep for a better tomorrow. Its ease of use and flexibility make it a top pick. I can’t speak durability wise, because I haven’t tested it for that. However, this steam mop leaves your room dry within seconds, with no streaks at all. It offers a very quiet operation – you don’t have to disturb the whole family while running this machine. It’s light and compact; you can store it nearly anywhere, provided it’s outside children’s reach. Despite the countless advantages that come with this product, a bit of drawbacks cannot be neglected. The steam mop will demand your support throughout the cleaning; it can’t stand on itself. This can be a challenge especially if you want to lift some luggage or move furniture to provide room for cleaning. Edge cleaning also needs some kind of experience and regular practice; otherwise, you won’t be able to meet the expectations. What do you think about this steam cleaner from Shark? Would you buy one? Have some experience with it? Please share it with us. Shark Blast & Scrub – a new Steam Pocket Mop, but is it worth it? Shark Steam & Spray Pro – the review of the newest steam mop in town Shark steam mop: the Pocket model cleans well and still leaves something in your pockets Multiple cleaning needs? Manage them with Shark Rotator Vac or Steam The new Bissell Symphony All-in-One Vacuum and Steam Mop. Is extreme marketing influencing this review?